For most people cleaning has become a long and tedious process. Anyway some of us see how funny things actually are. Humour is the best way to show things that are true, otherwise uncomfortable to say. House is so clean! Was the Internet down today? I bet that every housewife has caught herself wasting time in front of the screen. Especially when there is a lot of work to do. The worst is, that the more you stay on the computer, the more the work gets. 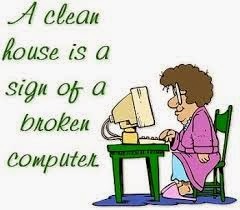 The secret of the clean house: Don’t let your children or husband in it! Let’s admit it, they are the prime reason for the dirt. And they won’t appreciate the effort put in cleaning, until they have to do it themselves. There is a saying: “Don’t mess, where you don’t clean!” Do your children clean anywhere at all? I won’t ask for your husband! A good way to give your man a lesson is to ask him for money every time he ruins the carpet with his dirty shoes. This way you can call steam carpet cleaners, and save your efforts. I bet that next time he’ll be more careful. Super Bowl: A toilet that cleans itself! I wish there is an automatic self-cleaning toilet bowl. If someone invents it, I’ll be the first one to buy it. Put this condition to your family: If you find the toilet messy, no dinner for tonight. This will save some of your labor. Is your son’s room clean? He either has a girlfriend, or an exam! If your son’s room is clean, this is something that is worth taking a picture. Too badly that it doesn’t happen too often. If he has a girlfriend, it is a good reason. But if he has an exam, it is a bad excuse not to study. Oh, by the way, also make sure that he hasn’t called a professional cleaning company to do the job. Next time, when you hear something that is worth telling, don’t bother to share the fun.